11/15/2016 The global market for homeopathy products "has skyrocketed in the past few years with sales of amounting to billions of dollars in key regions such as Europe, North America, Asia Pacific, and Middle East and Africa. Aversion to allopathic medicines, a constant rise in demand for convenient dosages of a variety of medicines, and an increase in consumer confidence about alternate treatment methodologies are all significantly fueling the market growth." There is a continued and sustained growth of homeopathy use due in part to the increased demand for non-toxic, organic and non-GMO alternatives. Genexa® has introduced the first USDA certified organic non-GMO medicines. subsequently less nausea and vomiting and urinary retention associated with the use of narcotics?? 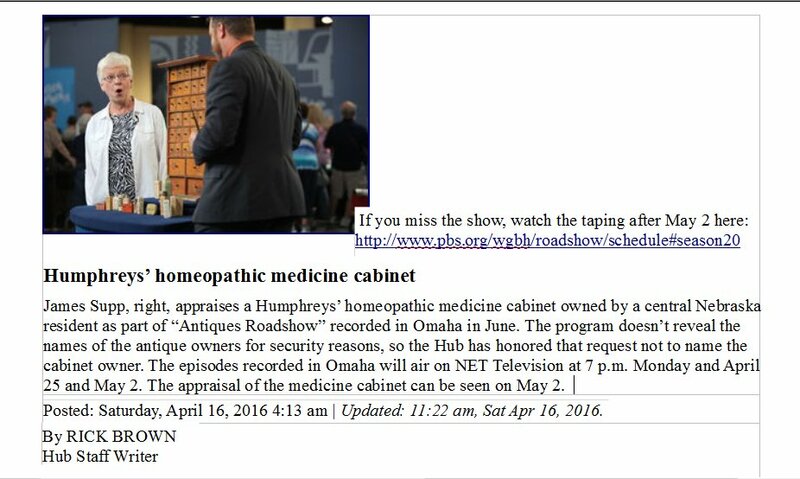 17-April-2016 Mark your calendars to view the Antiques Roadshow appraisal of an old Humphrey's homeopathic remedy storage cabinet on April 18th (tomorrow), re-aired on April 25th and May 2nd on your local PBS station. The photo below shows the owner's surprised reaction! 13-April-2016 England's Queen Elizabeth, II will celebrate her 90th birthday on the 21st of this month. Her mother, the "Queen Mum" died in her sleep at the age of 101. The "Queen Mum"'s medical history was not extensive, only noting bone fractures due to falls and routine cataract extraction surgery. Since the mid 1800's, members of the Royal Family have had their own resident medical doctor who is also trained in the practice of homeopathic medicine. The "Royals"' legendary longevity and good health is a strong testimony to the power of this form of medicine. Even the Queen's beloved Corgis are treated with homeopathy. This article by Geoff Baker in the Local People Section of the London Weekly News "What’s the secret to royal long life? It’s homeopathy, naturally" tells you more. To add to the post above, I grabbed THIS information about the British monarchy's use of homeopathy which was tweeted by John Benneth, a homeopath in Oregon. Thank you John! 03-April-2016 India and the United States to partner in research into the value of homeopathy for cancer treatment. Homeopathy is reliable and safe enough to be used by astronauts on the moon.